I’ve been playing the Tsugaru shamisen for a couple of years, with a lesson almost every week. In that time, I’ve made good progress, and I’ve learned a whole lot of pieces. What I haven’t seen much of, however, is good quality sheet music. The shamisen has its own tablature-based notation system. As it’s quite a niche instrument, especially outside Japan, there’s not really much software to help with making scores, and a lot of scores are handwritten and/or multiple-generation photocopies that are hard to read. 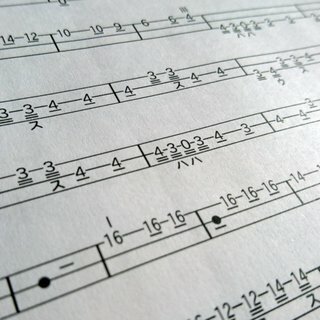 Motivated by one particularly illegible score I was trying to learn, I decided to do something about it. I haven’t written much on here for a long time, and one big reason for that was that my old publishing platform was unmanageable: it was a hacked version of a very old version of TextPattern that would only run on a long-dead version of PHP.